I was on my way to a presentation in Midtown yesterday morning and ended up chasing down a man ahead of me. I was curious about his raincoat, which it looked like he was wearing inside out, and I just had to get a better look. So if you can imagine it, I went dashing down the subway platform in heels, carrying a heavy tote bag on one shoulder and swinging a large portfolio in the other hand (very glamorous, me with all my bags), just hoping I could catch up to him before he got onto the subway and the doors closed without me. Anyway, this got me thinking again about bias binding as a design element. The Oliver + S patterns often use a little bias binding at sleeve hems for a neat, clean finish. For example, both the long sleeve and the three-quarter sleeve version of our new Apple Picking Dress use bias binding at the sleeves. But have you even considered using bias in other places on a garment as a design detail? 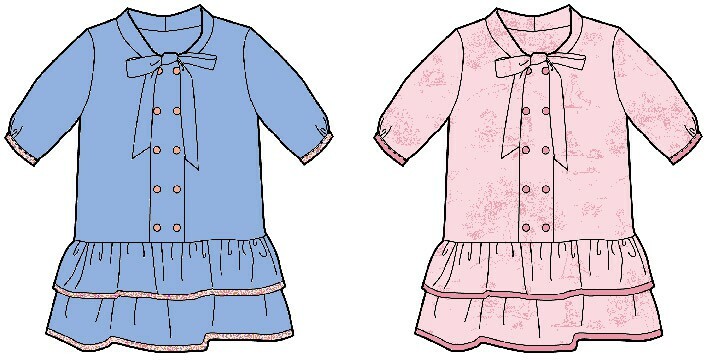 What about using it as the hem on both skirt ruffles of the dress (View A) as well? Here are two illustrations that demonstrate what it might look like. 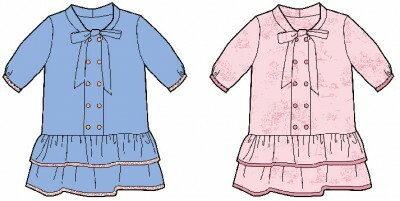 I think it’s a cute way to emphasize the double ruffles at the hem and to relate back to the sleeve detail. It’s also a great way to incorporate a contrast or complimentary color or print. And you won’t need to wear anything inside out to get the look, either. Bias is easy to make and to apply. I’ve given very though instructions for it in Little Things to Sew, if you’re interested in trying it. I’m curious to see how you use it in your own sewing projects! Very timely post! I’m making this dress in a light, fluttery silk fabric (don’t know the name of the type of fabric, I’m afraid) and have been worried about finishing the ruffle edges as it’s a bit tricky for me to handle and seems very fray-prone. I will try this out on a scrap and see how it works. I am happy to know I am not the only person that want to stop people on the street and feel and inspect their clothing. I love your pattern and I am looking forward to seeing your booth at market next month. I love that you chased after him to get a closer look at the construction of his coat! I sometimes catch myself studying someone’s clothing construction and forget to listen to what they’re saying. Also, I adore bias binding. Especially homemade.